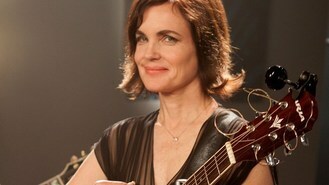 The actress found time between shooting the hit ITV1 costume drama to record a new album with her group, Sadie And The Hotheads. Frontwoman Elizabeth said of preparing for her live performances: "I don't have any method except to embrace the terror, that's the only thing I can think of that I do. "I throw myself into it somewhat like the footage of that guy skydiving from space. That correlates to me with that initial walk-up to the microphone to get into that first song, putting your arms around that feeling of terror. It's got easier for me as I've done more gigs." The London-based US actress, who plays Cora, Countess of Grantham in Downton Abbey, enlisted her on-screen daughter Michelle Dockery (Lady Mary Crawley) for one track on new album How Not To Lose Things. Elizabeth said she and Michelle found a "special connection" through their love of music. "There were the days when we would always be running back to my trailer to hike up our skirts and play songs, we don't do so much of that now - it's difficult because in the last season we weren't thrown together in scenes as much as we were in the first season, so we sort of got out of the habit of it," she added. The singer and actress is now hoping that Downton Abbey fans get behind the new record, which is released on October 29. "The hope is that they'll get a kick out of it because I think that a lot of what my music is about is being a parent, being a mother which of course is very much what the part of Cora is about and I don't think that's different really, whether you're in 1918 or 2012," she said.